I love my nails - they grow fast and strong and I have never been one to shy away from bold/fun colors and designs on them, but these days [snowed under with kids and home] it sometimes takes a little bit of a boost to get things going or to get the time needed to make something special out of my own nails! 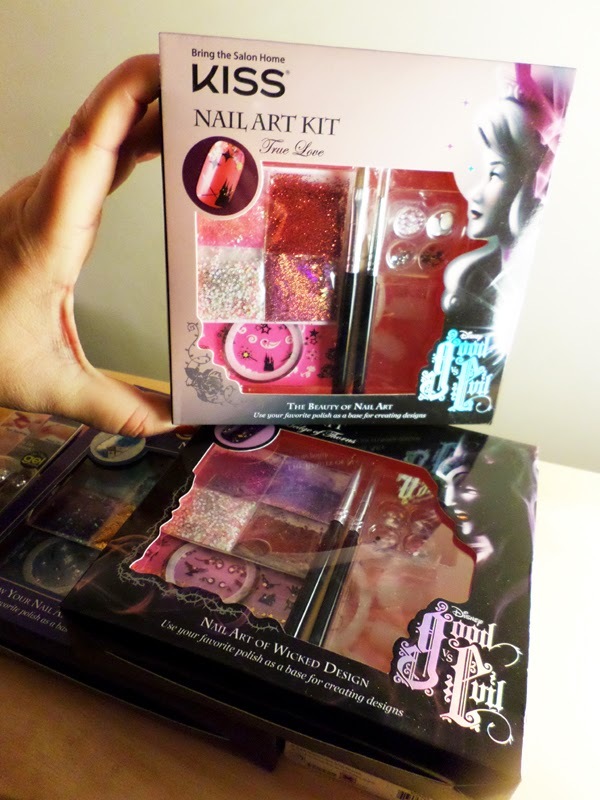 This year, we are making it a team effort, me and my little girl, as we put together these fun nail art sets from KISS, which feature Good and Evil Disney themes along with a Jasmine Disney Nail Art Kit and goodies from their Holiday Nail Collection! 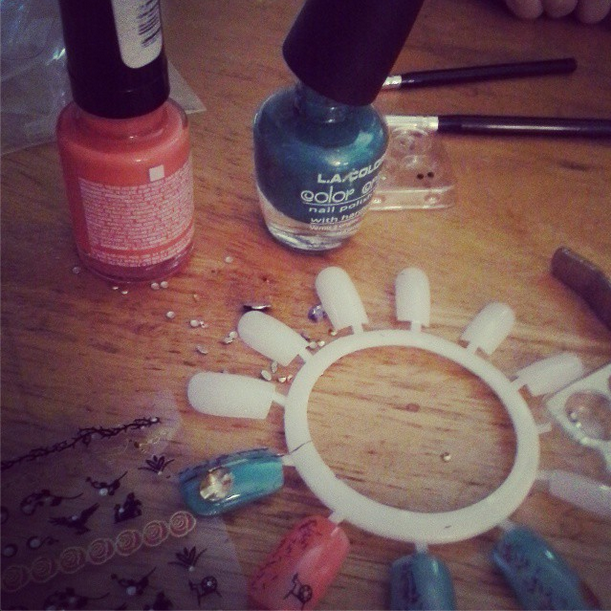 The nail art kits are SO MUCH FUN! My daughter is 3 and so doesn't wear false nails but she does like to help decorate them for me or use the decorations to embellish her own nails - a sticker here or there is a lot of fun for her, but I do not let her use these kits on her own - always supervised very closely. I love that each kit comes with enough decoration to make nails that you enjoy a few times over, with Hedge of Thorns and Black Magic when you're feeling Evil and Briar Rose and True Love when you're feeling Good - or mix and match when you're feeling a little in the middle! Why not! Your designs can be sealed in with a little top coat and you will have to provide your own nail polish for these designs to be layered upon, but there are so many different ways to embellish your nails that no two designs have to be exactly the same! We used a green and an orange color to spice up the nails with one of the Evil sets and they turned out actually pretty happy and so it just goes to shoe how versatile they actually are! The nails are easy to attach and easy to remove and can last a while in-between, which makes a good deal for the money! There is plenty of design material left after the first application that you can have more fun with your own nails, too - or treat a friend to a glam nail day, it is really up to you!! The Jasmine kits run similar to the Good Vs Evil kits and make a wonderful gift for just about everyone young and old - lots of fun and really get your creative juices flowing! I especially love the Limited Edition Holiday Collections that I had the pleasure to try, too, though, which are Limited Edition Holiday imPRESS Press-On Manicure nails by Broadway Nails & KISS Gel Fantasy Nails! These nail kits come ready to press on and take very little effort to attach to your own nails and VOILA! ready to impress at your holiday function or on a special night out - or any other day of the week or for no occassion at all other than to treat yourself! I can't wait to show off the Painted Veil nail set, which has a black base and little gold fleck details, which are very simple and stylish and attached within 10 mintes with ease and shaped to fit well - something I have had a problem with before in the past as my nails are very similar in size and so the fact that there are a wide choice of sizes here in the kit actually helps a lot!! If you want to delve into the art of false nails over the festive season then you should certainly look up www.kissusa.com and imPRESSmanicure.com and follow @BwayNails and @KISSProducts on Twitter to stay up to date with all the fun new goodies out there waiting for your to get your hands on - or to get on your hands! Note: The KISS Disney Good Vs. Evil Nail Art Kits are available from October 2014 for $9,99 each! 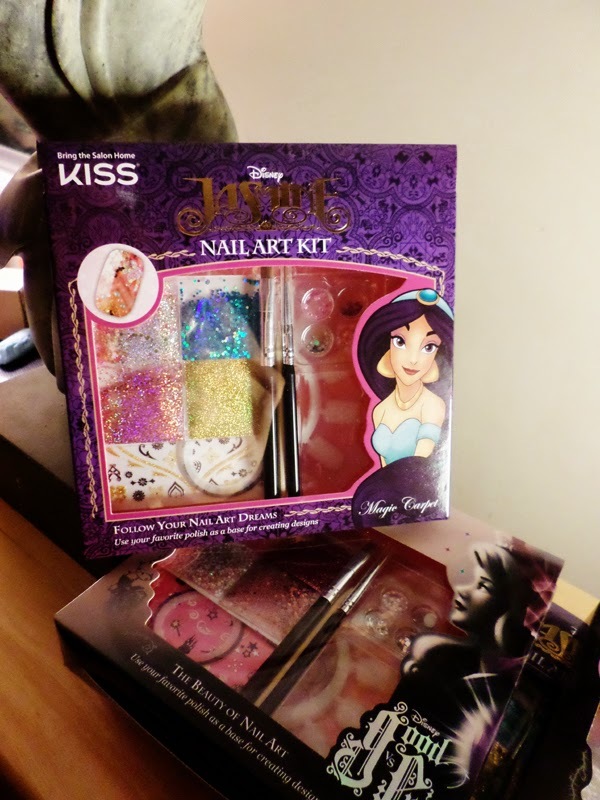 The KISS Jasmine Disney Nail Art Kits are available from December for $9.99 each, also! Both sets are available in Walgreens and Drugstore.com. You can pick up the Limited Edition Holiday Collections from November-December at Harmon, Bartell Drugs, Marcs, BeautyOnlineSupply.com! These sets, and more, make it into our Holiday Gift Guide for 2014 and you can keep up with us on Twitter, now with the hashtag #MGBHGG as well as by checking out our list via the tab at the top of this blog! Disclaimer: I was given products in exchange for this review, but all opinions on those products are 100% my own, honest, opinions and your views may differ! Thank you!